A Possible Symbiotic Relationship Between Type Ia Supernovae, Recurrent Novae, and Classical Novae: Do These Events Occur in the Same or Different Stellar Masses? Astronomers are trying to determine the answer to the question of whether there is a direct relationship between Type Ia Supernovae (SNeIa), Classical Novae (CNe) and Recurrent Novae (RNe). Some evidence has been found to support a distinct relationship between catastrophic SNe events and RNe outbursts. There is evidence that a tipping of the scale into a full-fledged Type Ia SN may be related to RNe, and though some evidence seems to point to this, all the particulars are not out regarding the three types. Do the three events occur within the same stellar mass, or are they separate events occurring in separate stellar masses. Las Cumbres Observatory Global Telescope Network. 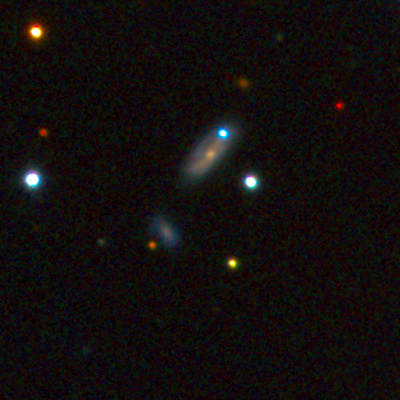 The results of a study, led by Ben Dilday, a postdoctoral researcher in physics at UC Santa Barbara and at Las Cumbres Observatory Global Telescope Network (LCOGT), are surprising because previous indirect –– but strong –– evidence had pointed to the merger of two white dwarf stars as the originators of other Type Ia supernovae. One interesting subject is the planetary nebula NGC 5189. It has a unique, torqued-spiral shape, with peculiar patterns of knots around its periphery, possibly due to a wobbling in the stars' rotation, or, possibly, to the presence of a binary white dwarf system at its center. Symbiotic binaries are systems containing both a white dwarf (WD) and a red giant component. Symbiotic novae are those systems in which thermonuclear eruptions occur on the WD component. These are to be distinguished from events are driven by accretion disk instabilities analogous to dwarf novae eruptions in cataclysmic variable outbursts. Another class of symbiotic system is that in which the WD is extremely luminous and it seems likely that quiescent nuclear burning is ongoing on the accreting WD. A fundamental question is the secular evolution of the WD. Do the repeated outbursts or quiescent burning in these accreting systems cause the WD to gain or lose mass? If it is gaining mass, can it eventually reach the Chandrasekhar Limit and become a supernova (a Type Ia SN if it can hide the hydrogen and helium in the system)? In order to better understand these systems, a new study has begun of the evolution of Thermonuclear Runaways (TNRs) in the accreted envelopes of WDs using a variety of initial WD masses, luminosities, and mass accretion rates. Astrophysicists have put into use a 1-D hydrocode, NOVA, which includes the new convective algorithm of Arnett, Meakin, and Young, the Hix and Thielemann nuclear reaction solver, the Iliadis reaction rate library, the Timmes equation of state, and the OPAL opacities. It is reported that (1) the WD grows in mass for all simulations so that canonical 'steady burning' does not occur, and, (2) that only a small fraction of the accreted matter is ejected in some (but not all) simulations. They have also found that the accreting systems, before thermonuclear runaway, are too cool to be seen in X-ray searches for Type Ia SN progenitors. 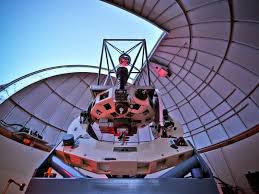 Las Cumbres Global Telescope Network. The case of SN PTF 11kx, discovered by the Palomar Transient Factory, showed this relationship beyond further doubt. Astronomers could discern that the supernova was surrounded by shells of hydrogen gas that had likely been blown off in previous nova eruptions, decades before the supernova occurred. Novae are more frequent but weak explosions not catastrophic to the star. While similar shells of material had been seen before in a handful of Type Ia supernovae, their origin was debated and they had never before been firmly linked to novae - some doubted that the material was near to the supernova at all. SN PTF 11kx proved differently. The surrounding gas was moving too slowly to be from the supernova event itself, but too fast to be from a typical stellar wind. Lars Bildsten, director of UC Santa Barbara's Kavli Institute for Theoretical Physics, hypothesized that it was material shot out from a previous nova eruption, which had been slowed as it collided with the wind from the red giant star. UCSB graduate student Kevin Moore showed this hypothesis to be plausible and would lead to gas moving at speeds seen in the observations. Adding credence to the theory was the fact that the material moved at two different speeds -- faster-moving interior material to slower-moving exterior -- exactly as expected. The outer material had been slowing for decades, while the inner material had less time to slow. But if this was the case, the fast-moving supernova ejecta should have eventually collided with the nova material. About two months after the explosion, this is exactly what happened. New observations showed that the supernova ejecta was colliding with the interior shell of material. It was impossible to doubt that this gas was nearby the supernova. "This was the most exciting supernova I've ever studied," said Dilday, "For several months, almost every new observation showed something we'd never seen before."